What’s the main resource and primary driving force of every business? Probably, it’s money but it’s better to call them the final goal on a par with reputation and fame. Wherein, customers are a more viable answer to this question. People who need your product or service, ones who will purchase it, generate revenue and build the mentioned reputation. In this case, it looks logical to consider various expenses as related to customers’ satisfaction and irrelevant. Customer relationship management software cost is related to clients directly. Basically, CRM systems are useful for all teams which work with individuals or companies and have to process certain data. However, only a few managers clearly realize the real costs of such apps. The catch is that declared prices listed on the vendors’ sites represent final costs partially. In practice, you will face extra expenses on connecting old systems, optimizing processes, training employees, and so on. Plus, there will be hidden losses related to performance dips during the training period, for example. This guide is dedicated to the total CRM system cost idea. We will find out basic elements of the cost, their meaning and importance, ways to avoid unnecessary losses, and insights on the most efficient software. If you ever wanted to learn about software prices, look no more. As you can assume, it’s impossible to get the idea of certain software prices without knowing definitions and working principles, at least. Hence, let’s look at two of the most important abbreviations: CRM and TCO. The first term – CRM – gathers all possible software solutions which help a given business to manage interactions with customers. Strictly, even Excel is a primitive CRM system but we will focus on more modern and useful stuff, obviously. Today, a traditional CRM application is a single platform which unites all core business operations under one roof, so your employees use data from single storage, reduce waiting time for clients, and enhance personalization. They help to acquire all the possible leads thanks to the perfect automated fixation of each call, email, and even website visit. They optimize workflows because of common data standards, one and only database, and significantly accelerated processing. They deliver valuable reports and analysis as they store big arrays of information which include statistics, visualization, and teams’ results for each customer. They represent the vision of a perfect business, means, they often include best market practices with which you can learn how to work with clients. Ultimately, CRM can be a nice product for nearly any company but you always should clearly understand the pros and cons of implementation. For instance, a land-based retail store doesn’t need a CRM app because it relies on person-to-person communication and doesn’t rush for new clients. Simultaneously, even the smallest online shop will benefit from CRM integration. Starting costs: software itself, hardware (if needed), implementation, data import, licensing and training of existing users, customization. Operational costs: maintenance and support, fixes, recovery, security, upgrades, licensing and training of new users. Retirement costs (for legacy software): data export, archiving, deactivation. Usually, the final software cost depends on your wishes. A simple CRM app on an existing tech basement will cost much cheaper than a custom platform packed with enterprise-grade functionality and designed for your team exclusively. Wherein, this custom product will cover all your needs and benefit the business with its uniqueness. That’s why it’s essential to understand the objectives and realize whether you really need one or another app type. If you want to compare two products in terms of TCO, try this online calculator. It helps to look at the differences between on-premises and SaaS apps on the 10-years’ timeframe. 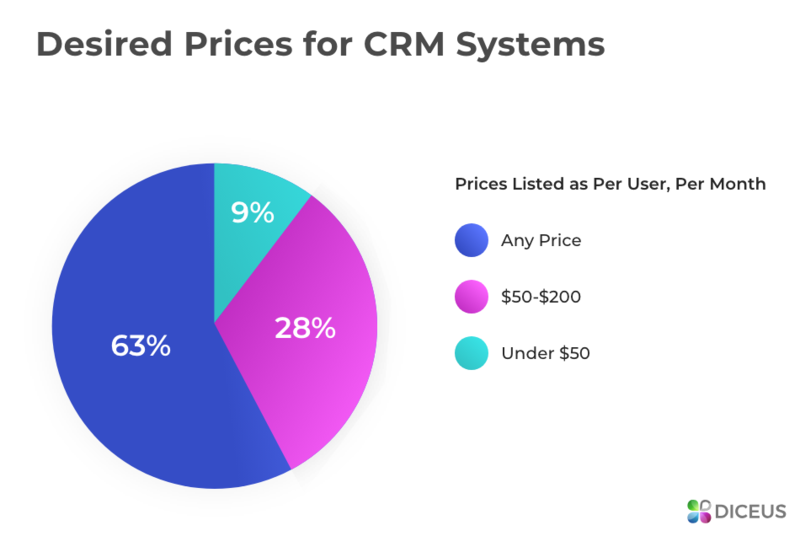 Now, it’s time to move to a breakdown of CRM prices. Keeping in mind facts about CRM systems and software costs, we will be able to combine these two things to get a clear picture of customer relationship management software cost. It starts with the first ideas and finishes when a developer provides post-launch support services. Read about each point further. First things first, each project begins with the initial plan. It means that you should talk to key managers, employees, and stakeholders to define the company’s vision and exact tasks which a CRM system should handle. Say, an ordinary e-shop will need a simple one-layer catalog for users’ contacts, a database for all the related info, tools for email marketing, tracking, and reporting. Simultaneously, a multinational corporation should opt for enterprise-grade catalogs and powerful accounting systems, in addition. In a nutshell: define the company’s goals in terms of customer experience. The planning stage takes 10-20% of the final budget. Here, you should deliver the plan to people who know how to create apps. Regardless of the chosen development team, you want to clearly state all requirements to be sure that partners understand objectives. This is especially important for custom devs who can create anything you want but need some guidelines. In the case of prepackaged apps, you only can ask for minor customization. At this stage, it’s better to decide which modules you want exactly and how the system will be deployed (on-premises or SaaS). In a nutshell: cooperate with developers to get the desired CRM application. The designing stage takes 20-40% of the final budget. Testing. Find bugs, fix them, run QA programs, test UX/UI, and so on. Data migration. Transfer core information from old systems to the new one. Connecting. Make sure that all apps are compatible and work seamlessly. Launch. Disable legacy systems and start using new products. 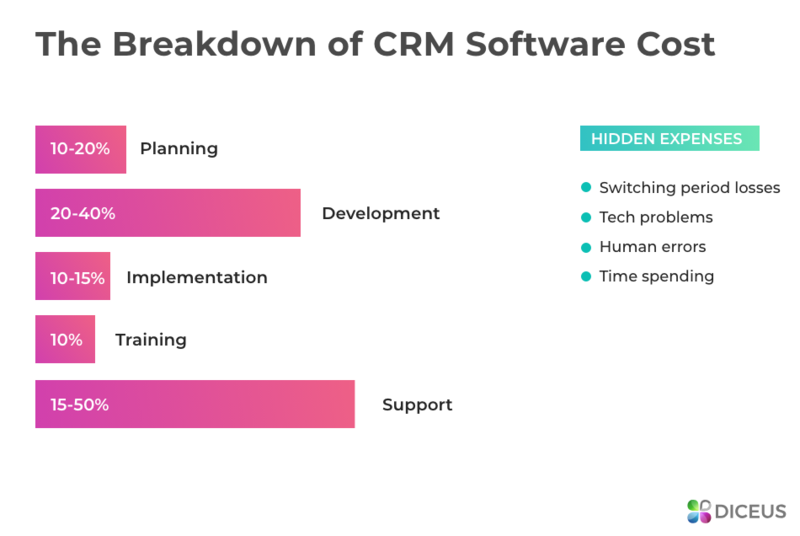 As you see, the implementation itself is the last step only and it’s responsible for 1/4 of this stage’s CRM system cost. Pay high attention to each part to be sure that everything works fine and your team is ready to switch. In a nutshell: work with developers to install the product without issues. The implementation stage takes 10-15% of the final budget. Often, managers forget about this essential stage because they think it will be easy to teach employees. Nope, it will not. Prepare for some troubles, especially, if you have more than 10 staff members in the team. Generally, we suggest asking CRM developers to give a few lectures and training sessions to help workers with the new software. It’s always better when experts who create the system from scratch tell about their brainchild because nobody knows it better than they. Investing in good training reduces extra expenses, as a rule. In a nutshell: familiarize employees with the new software system to be sure that the team can get maximum benefits. The implementation stage takes 10% of the final budget. When the new system is active and employees use it without significant issues, it’s time to think about the future. The global business ecosystem is large and evolving so almost any company will have to change over time. Try to predict scalability needs at the moment of software creation because developers will be able to upgrade apps easier in this case. As well, don’t forget about unexpected errors or bugs, tech shutdowns, users and customers who need support. In a nutshell: take care of customer support and tech maintenance including bug fixes and necessary upgrades. The support stage is lasting and includes all contingent expenses, so expect to spend from 15% to 50% of the initial budget. Switching period losses: lost core data packages, customer’s info or leads. Tech problems: bugs, miscommunications, data conflicts. Human errors: various fails related to poor knowledge of new apps. Employees’ time spending: more efforts in training and testing. Managers’ time spending: more efforts in implementation and oversight. The last two points are the trickiest. They mean that your staff members will focus more on CRM-related questions instead of direct tasks. Thus, you will inevitably face a performance dip and some revenue decrease. Different CRM vendors list different prices but it’s not only about the difference in amounts, say, $1 million against $5 million. It’s more about approaches and models. While the majority of companies is ready to pay any price for a suitable application, almost one-third of the SelectHub’s respondents agree on $50-$200 per user per month. From them, 12% choose $50-$100 and 16% opt for $100-$200. However, the price distribution is a bit more complicated. Let’s check four key pricing schemes to understand the customer relationship management software cost better. Vendors of ready-made solutions often work under this scheme. They list a few plans with different sets of features and prices but all of the plans are based on the user subscription model. It means that you should pay for each person who uses the CRM system monthly. For cloud SaaS platforms, prices are $10-$100 per user per month on average. For in-house applications, you can choose a license model. It’s also based on users but features one-time payments for each, so expect from $250 to $1000 per one license. Professional enterprise-grade CRM solutions will cost more than $1000 per user. Plus, some companies require annual renewal of the subscription. Unlike traditional vendors, developers of custom applications tend to ask for only one payment for the entire product. Simply put, to get a CRM system, you should contact the chosen team, negotiate desired features and services, and agree on the final cost. Usually, contracts list all expenses including operational and contingent ones. Pros of this scheme are clear as you can get the perfectly tailored app without the need for monthly or yearly renewal. However, a bit complicated acquiring process and high first payment may look unsuitable for small and medium businesses. In this case, you want to find a development firm which focuses on SMBs and knows how to interact with them. Lastly, there are some platforms with open code. They are provided for zero CRM system cost but feature pretty poor functionality. Some developers of free apps rely on users who upgrade and modify products independently while others list both free and paid plans for different categories of subscribers. Free CRM apps are wonderful for SMBs and startups which want to realize how this software works. Free applications are available as accounting software for insurance brokers as well as tools for other industries. Hubspot. $0 / $53 per user per month for different packages. Microsoft. $112 / $206 per user per month for different packages. Oracle. $68 / $104 / $210 / $314 per user per month for different packages. Sage. $39 per user per month or $1069 per user license. Salesforce. $26 / $78 / $156 / $313 per user per month for different packages. SAP. $20 per user per month. Zoho. $17 / $28 / $45 / $112 per user per month for different packages. The second approach is based on custom development. Teams create unique solutions with features sets created for each client. In this case, the average cost of CRM software depends on demanded functions and requirements, so you should plan a budget even more carefully. Try to understand which business tasks are the most important and then tailor the software to meet these objectives. Surely, developers often help you during planning. Our team also works with each partner personally. We begin with consultations and analysis of your business to advise which CRM system or modules will suit your processes. Then, we handle the entire customization, implementation, testing, training, and support. All prices are transparent and you’re free to discuss each part of the final cost. Additionally, we don’t feature hourly payments because we believe in quote-based pricing efficiency. If you want to understand how to cooperate with custom CRM developers, check the related article. The last part of the guide is dedicated to frequent questions and answers. The info is concise so you can remember it simpler than the whole article. What is a CRM App? CRM is a set of software tools which are focused on work with clients including data keeping and processing, chatting, delivering offers, and receiving feedback. CRM apps facilitate all aspects of interaction with customers. You can get more data about clients faster, create more personalized offerings, and improve the user experience. Apart from free applications, prices of CRM systems start from $10 per user per month. For custom products, costs start from $50,000 for everything. Which Software Type Is Better? It always depends on your needs. SMBs can benefit from traditional out-of-the-box software but we recommend custom applications is you have specific tasks. At the end of the day, you should remember two insights. The first one relates to business operations. It’s crucial to know them to be able to choose the best CRM or any other professional software. The second thing is about costs, obviously. You should consider various aspects of the total cost to be prepared for any difficulties. Hence, detailed and elaborate plans are also vital for businesses which want to get a CRM app. In Diceus, we can help you with both understanding business requirements and planning development. Stay tuned!